82,431 fans collectively held their breath in Doak Campbell stadium late Saturday night. In an atmosphere that was anything but calm, a deafening silence spread throughout the crowd when Notre Dame capped off a touchdown drive with no time left. Florida State’s unbeaten run appeared to have come to its reluctant end. Yet as thousands of fans began mourning the Seminole’s first loss since the 2012 season, the referees quietly huddled together in front of the end zone in which Notre Dame players were already celebrating. A flag had been thrown for offensive pass interference. Two Notre Dame receivers engaged in picks against their respective defenders before quarterback Everett Golson released the ball. The 2-yard touchdown pass to wide receiver Corey Robinson was negated, and the Seminoles had life again. On the ensuing play, 4th and 18, with a touchdown being the only option left, defensive back Jalen Ramsey was able to get enough pressure on Golson to force his throw off target and into the hands of linebacker Jacob Pugh, and the Irish’s bid to upset the ‘Noles was effectively over. FSU pulled off yet another magical escape act to keep its unbeaten streak going. Head coach Jimbo Fisher seems to be okay with that sort of magic. “This team has heart, it has soul, it’s a family. It believes in each other, it sticks together and there’s something special in this group of guys,” said Fisher. The 2nd ranked Seminoles came into the game with everything to prove, being displaced by Mississippi State earlier in the week as No. 1. FSU has had plenty of critics this season, for both on the field performances and off the field issues. Fifth-ranked Notre Dame is likely the biggest threat FSU will face this season, but on Saturday night, FSU used that threat as a way to answer some of the doubts about its rank. It was not easy to do. 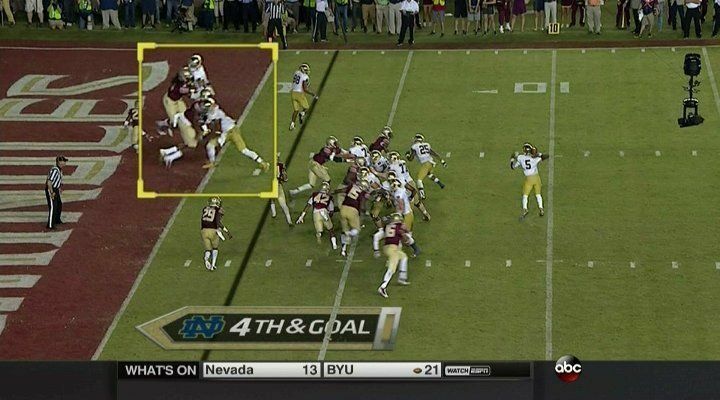 As much as FSU fought, it seemed it just couldn’t catch Notre Dame. The Irish jumped out to an early lead and would not give it up until midway through the fourth quarter. Golson went 31-52, throwing for 313 yards and three touchdowns. Two of those touchdowns were to Corey Robinson, who finished the game with 8 catches for 99 yards. Each Seminole score, except for Karlos Williams’ second touchdown run in the fourth quarter, was promptly followed by a Notre Dame answer. FSU’s defense gave up a total of 470 yards, falling victim to both the run game and passing game. For much of the contest, Notre Dame appeared to be the better team. The Irish outgained the Seminoles 284-106 in the first half. FSU’s rushing game was once again ineffective, producing only 50 yards on the night, as opposed to Notre Dame’s 157 yards on the ground. The outlook wasn’t bright for FSU early in the game, entering halftime trailing 17-10. But the Seminoles are a resilient bunch. Fight, they did. And they were led by none other than quarterback Jameis Winston. FSU started the second half by scoring a touchdown on its two opening drives. Winston was 15-16 after halftime, throwing for 181 yards and one touchdown. In total, he went 23-31 for 273 yards, two touchdowns and one interception. His teammates indeed rose up with him. Rashad Greene caught a 10 yard touchdown pass to cap the Seminoles’ opening drive of the second half. He finished with 108 total yards. Travis Rudolph, Ermon Lane and Jesus ‘Bobo’ Wilson also made big catches down the stretch to help FSU to its win. Rudolph caught the other touchdown pass from Winston in the first quarter. Running back Karlos Williams provided the final two touchdowns for the Seminoles, displaying an exceptional competitiveness as he fought his way into the end zone both times. Williams’ touchdown midway through the fourth quarter gave FSU its first lead of the game – the only one it would need. Both teams entered the game undefeated, but it is FSU’s win streak which remains intact, if only barely. FSU is now hoping to regain its status as No. 1 in the nation as it marches on toward the playoffs. Notre Dame’s season is by no means over because of this loss. It joins an impressive group of one-loss teams still in the hunt to earn a spot in this year’s postseason. Next up for the Irish is Navy, followed by a trip to No. 17 Arizona State. The Seminoles have a bye week next, but travel to Louisville for a tricky Thursday night game the following week.